Well, the Alice in Wonderland madness :) has already begun! I hope there are some upcoming beauty collections for this movie, because I missed all the 2010 ones (well I was able to secure the Paul & Joe one on eBay, but it cost me an arm & leg). 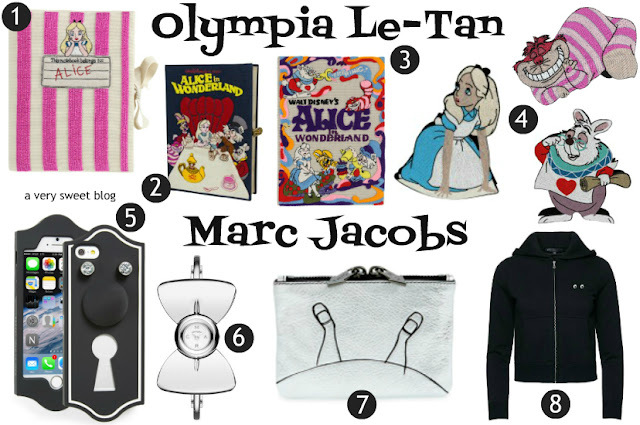 Olympia Le Tan has come out with not only clutches, purses and coin purses, but if you're a fan of Cinderella, Snow White, Sleeping Beauty, Dumbo, Bambi, etc. you should check out her ENTIRE Disney Collection online! Marc by Marc Jacobs also recently collaborated with Disney and his collection is called "I Am Not Like Other Girls". I love the little coin purse (available at Nordstrom)! The zippers say, "This" and "Way". Love Alice and Wonderland is a cool story. Oh I'd seen a trailer for this movie but didn't know it wasn't due till next year - funny how there is some products out already for it, but good to get a head start on the shopping, haha! Those Marc Jacobs pieces are divine! Helena Bonham Carter was perfect in that role. The Olympia le tan clutches are so fun! I loved the last film so I can't wait to see the next! I'm super excited for this movie! I haven't read through the looking glass either so in clueless as to what it's about too. And I agree that I hope theres some makeup collections for this! I read both Alice in Wonderland books when I was little and I loved them. 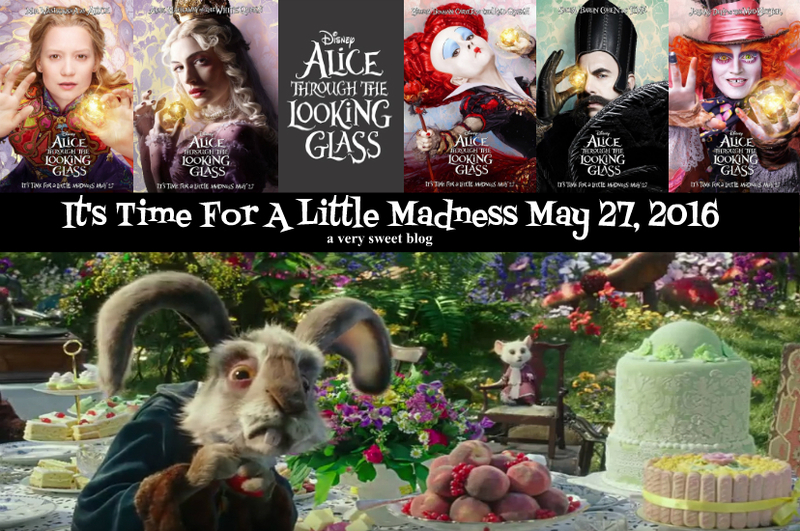 I think it would have been hard for me to like any movie version of the stories because of that, but I was so disappointed by Tim Burton's Alice in Wonderland and I don't think I'll even bother to watch Through the Looking Glass because of that. It's a shame, really. The costume design is lovely, but the rest for me isn't up to the quality of the original stories. I haven't read Through The Looking Glass either! However anything Tim Burton touches I love so I know I will love this one as much as his version of Alice in Wonderland! I am not the hugest Alice in Wonderland fan but I did enjoy the movie when I saw it a few years ago. I will have to remind my sister about Through the Looking Glass. She loves Alice in Wonderland and even dressed as Alice for Halloween this year. I enjoyed Tim Burton's Alice In Wonderland though I did feel like I was on an acid trip at times while watching it. It will be interesting to see how Through The Looking Glass is interpreted. That Marc Jacobs coin purse is super cute! I couldn't agree with you more. I was SO excited when the first movie came out because I usually love the Depp/Burton/Bonham-Carter trinity but that whole dancing thing from Depp was stupid. Because of the last one I may only rent this new one but I have to say all of these goodies, esp. the Olympia ones are gorgeous! But you should read 'Through the Looking Glass' it is seriously great! LMAO at Rowena's comment but it was exactly how I felt when I watched Tim Burton's Alice in Wonderland too! It was like an acid trip and at some parts, it was a bad trip. LOL! I had no idea Marc Jacobs collaborated with Disney, I'm off to check out the collection! I love the books and actually pretty excited about the movies. The items you picked are so chic! definitely like it! How cute is this?! I love Alice in Wonderland! Wow, that's something to look forward to. I haven't read that story yet. It must be an exciting adventure to read into the story. I am really looking forward to this movie! I'm so glad that designers often have items inspired by Alice In Wonderland. It's so much fun! I didn't know they were coming out with another movie! i love that alice in wonderland pouch! looking forward to the movie! I am super excited for this movie. I have not read the book either.